A man being chased by sheriff's deputies dropped his fiancee's 8-month-old daughter out of a moving car, sending the baby tumbling across the highway in her car seat. The girl was unhurt, but the man later was fatally injured in a crash. Dana Bettin, 23, died Sunday, three days after the highway chase that ended when he crashed his 17-year-old fiancee's car into an unoccupied squad car. Deputies began chasing Bettin after he was accused of domestic violence at a local hotel. By the time officers arrived, he had already left with the girlfriend's baby in the car. During the chase, Bettin slowed to about 10 mph, opened the car door and dropped the baby out in her car seat, which slid, spun and tipped over, sheriff's Sgt. Dan Pamenter said. Pamenter said the child was "crying a little bit" but calmed down when he picked her up and put her in his car. "She didn't have a scratch on her," he said. "She wasn't even dirty. She had on these little pajama things. She was just as content as any baby." 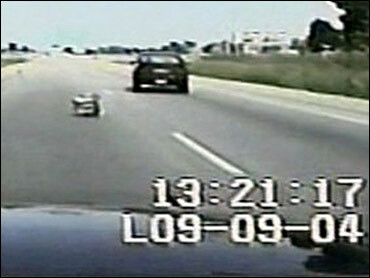 The chase continued at up to 100 mph, ending when Bettin's car crashed, rolled over and pinned him underneath. He died at a hospital in Green Bay. Sgt. David Catalano said that he spoke to the baby's mother on Monday and that the girl was doing fine. "I am so pleased the baby was not hurt. That was a huge relief. I couldn't believe my eyes," he said. Catalano said he had been told that Bettin was not the father of the child.